They say that everyone out there has a twin. Do ya ever see a celebrity and think you know who it is, then you realize it's a totally different celeb who looks the same? Check out these celebs who look like they could have the same mom then tell us who you think looks like they've been Separated at Birth. Actress Hillary Swank kinda looks like scary comedian Sandra Bernhard except she's much prettier. What makes these two look alike is their mouths and jawlines. They're large features that definitely stand out. 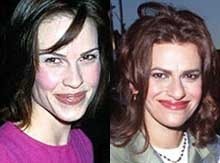 Both Hillary Swank and Sandra Bernhard also share similar noses but again Hillary's is much more dainty than Sandra's honkin' schnoz. Having the same hair color and similar hair styles also makes these two look-a-like. Do we have a match or should we start from scratch? Are Hillary & Sandra a Good Match? In some ways - I can see it. Maybe but Hillary is still way prettier.